This tee features original artwork screen printed onto a high-quality, 100% cotton pre-shrunk Gildan shirt. The product is well-made and constructed to last with seamless rib at neck and double-needle stitching throughout. 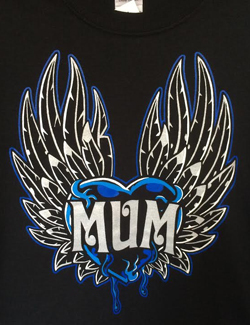 Buy now and wear your MUM pride all over town! This item is part of the exclusive collection of MUM products, designed here in our shop. Take home a piece of the independent spirit! See below for sizes, colors and options.